To say the Westbury Manor was buzzing Monday afternoon would be an understatement. 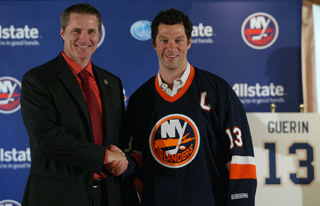 Over 100 media members, sponsors and guests traveled to Westbury to witness the next chapter in Islanders history as – in a surprise – Garth Snow introduced Bill Guerin as the team's 11th captain in franchise history. "I'm proud and privileged to introduce Bill as our next captain," said Snow at the press conference. "He's the consummate professional, a great leader and after talking things over with Ted there was no doubt that he should be named the next captain of the New York Islanders." On behalf of Mike Comrie, Ruslan Fedotenko, Jon Sim and their families, Guerin spoke to the packed room of guests. "I'm completely surprised, but thrilled about this tremendous honor," said Guerin. "I want to thank the organization for the vote of confidence and I will not take this captaincy lightly. Thank you Garth. Thank you, Charles. I'm excited about joining a team with such a wonderful history. I speak for all four of us when I say this is a group of players that wants to be here and play as team." Guerin continued by demonstrating the dedication he and Comrie have to their newly adopted community. The two of them became the initial supporters of a new team community program called Islanders Inspire. Guerin and Comrie have each donated 25 tickets and will provide transportation for children affected by cancer to every game this season. "Mike Comrie and I spoke last week and talked about giving back to the community," said Guerin. "We wanted to show our immediate commitment to the people of Long Island and we hope this is just the start." Islanders radio color commentator Chris King served as the Master of Ceremonies, introducing the four new players. After acquiring Sim on July 1, Snow added Fedotenko on the fourth, then Guerin and Comrie on July 5 to complete a thrilling opening week in July. 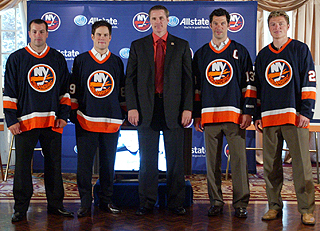 Snow presented each of the new Islanders with their jerseys. Guerin will sport 13, Comrie, 89, Fedotenko, 26 and Sim, 16. The Islanders made the event extra special by inviting a select group of sponsors and fans to take part in the festivities. The added company made for an enthusiastic audience. Those in attendance received autographs and took photos with the newest Islanders. "First class," said Fedotenko, who was joined by his wife Debbie. "All four of us have been in the NHL a while, but this is one of the most impressive events any of us have ever been a part of."